The Silver (Coho) Salmon running into Port Valdez are one of the best size average Silver Salmon runs in the State of Alaska. These Silvers are huge, they average about 10 to 12 pounds. Some years there are Silver's around 20 pounds or over caught out of Valdez. The run starts during the last week of July and goes through the first couple weeks of September. The Silver's concentrate in off Gold creek and Mineral Creek, just several miles outside Valdez. These Silver's are mostly caught from boats, trolling, mooching, or casting. Some fish are available by casting from shore. The 2000 season had the best return since 1985. The ADF&G estimated that 358,980 returned to Port Valdez, more then double the projected return of 160,000. Dave Cobb (Manager of Valdez Fisheries) estimated that the average size for the 2000 season was close to 15 pounds. We sometimes catch silvers while halibut fishing in July and August. 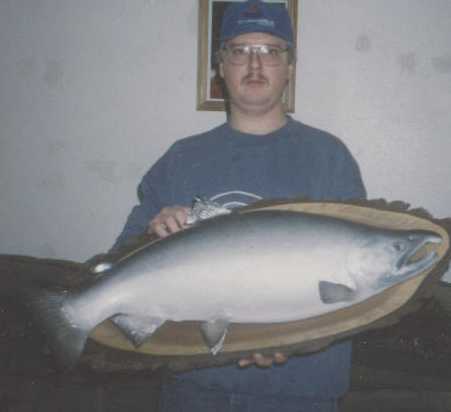 THE SILVER SALMON DERBY in 1998 produced a 19.5 pound Silver, which won the $10,000 Valdez Silver Salmon Derby. In 2000 a 20.7 pound monster Silver won the $10,000 Derby. The 2001 Derby produced a 19.40# and 19.36# Silver's. There are also daily and weekly Derby prizes that make buying a derby ticket a must. The daily Silver limit has been 6 fish per person in recent years. 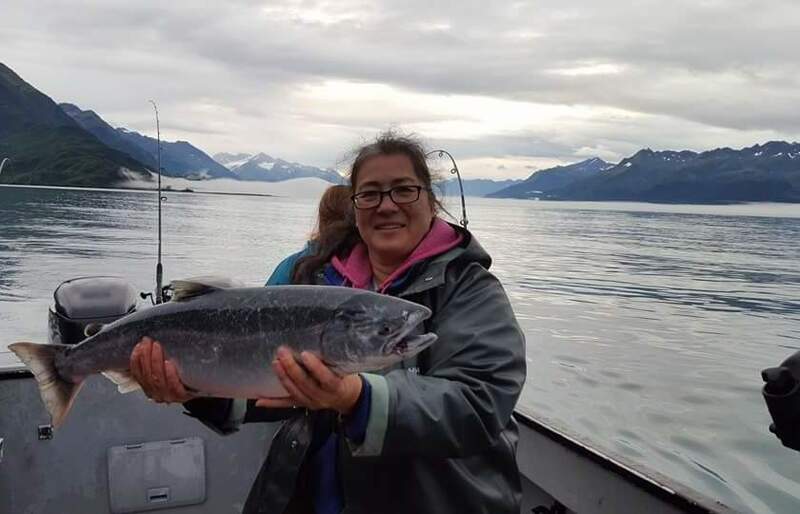 A lot of people will go to Valdez and take a 1/2 day salmon charter to see how to catch the fish, then take their own boat, or a rental out, to catch fish on there own. Depending on the condition, trolling with downriggers, Dipsy Diver type divers, trolling plugs, "mooching", or casting may produce. The Pink (Humpy) Salmon run in Valdez is huge. Each year approximately 10 million Pinks return to the Allison Creek (Port Valdez) area. The run starts around the fourth week of June and continues into late July. Six fish limits are common. Most people fish from shore around Allison Point. Casting small Pixies, or Vibrex spinners work well. The size average of these fish is 3 or 4 pounds. 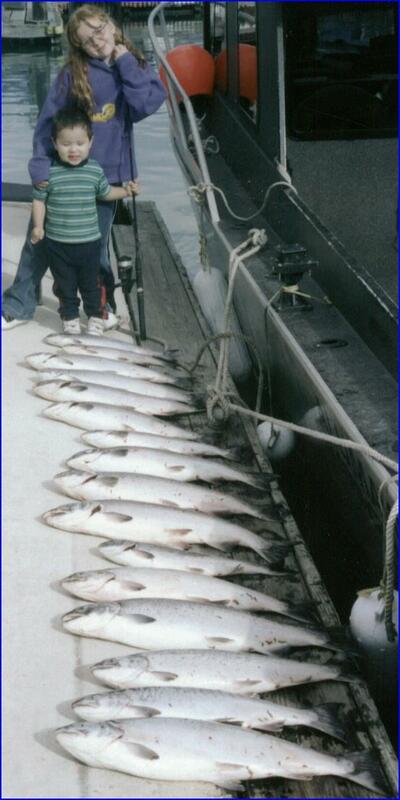 In 1999 approximately 14 million Pink Salmon returned to Port Valdez. King (Chinook)Salmon currently don't run into the Port Valdez or Eastern Prince William Sound, in large numbers. There are however, resident or "feeder kings" present in Eastern PWS all year long. The Valdez Hatchery has released King Salmon into Port Valdez over the last 20 years. The Valdez Hatchery released 50,000 King Salmon into the Lowe River, in the Spring of 1999. 150,000 King's were released during the 2000 season. Additional King Salmon stocking is expected to continue. We usually catch these Kings while we are trying to catch Silvers in late July and August. There are several streams in Prince William Sound that get runs on Red (Sockeye) Salmon. A productive way to harvest these fish is to get dropped off at the mouth of the stream and use various fly fishing techniques. 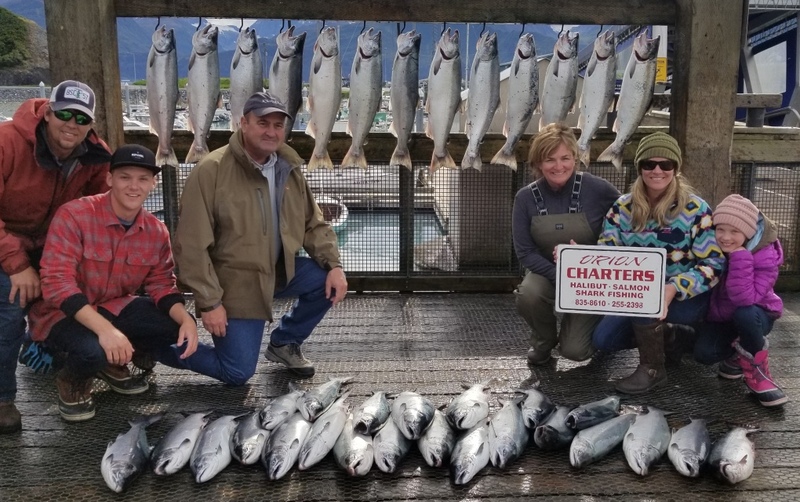 ORION CHARTERS may book Salmon fishing charters for the 2018 season. Check out these other pages for pictures and information. This page was last updated on 09/24/17.